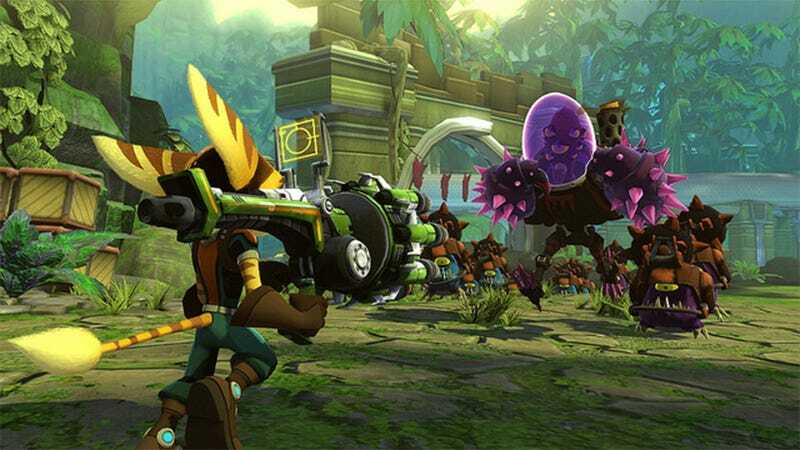 Along with the classic gameplay fans know and love, the downloadable Ratchet & Clank: Full Frontal Assault is going to mix things up with an integrated tower defense game and the ability for our furry friend to fight side-by-side with the legendary Captain Qwark. Ratchet & Clank: Full Frontal Assault pits Ratchet and Qwark against a new alien threat that has vile plans for the good Captain. The team will battle aliens through five levels spread across three planets in an attempt to stop whatever evil is brewing from achieving its ultimate goal of something really bad. Friends will be able to take on the game together in either local split screen or online multiplayer, no doubt causing violent fights over who gets to wear the Lombax pants. And yes, there's a tower defense element as well. Ratchet will build fortifications that bring his entire arsenal to bear on hordes of invasive aliens. I'm sure that'll be lovely. We'll know for certain later today — we've got people playing with the game as we speak. In the meantime, check out the PlayStation Blog for more debut screens of the next big furry and robot adventure. UPDATE: Sorry! We didn't get to this again today. We'll have more on the game tomorrow.